According to the NOAA, March – May was the wettest 3 month period on record for New York State since weather recording commenced, 117 years ago! Here in Westchester County, we officially started taking 2011 seasonal records on March 15, and since that time, we have accumulated 20.90” of precipitation - with 5.95” of this precipitation having fallen in the month of June alone. When we compare these numbers with 2010, we note that we have accumulated over 2x the amount of precipitation (both for the month of June and the season) than we had received this time last year. So, what does that mean for conditions in the landscape? A number of things, but let's stick with a major one for the purposes of this post. Mosquitoes may come to your mind first, but the wet, warm weather has also been ideal for a range of insects that impact all sorts of plants, including trees and shrubs. 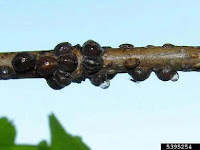 Scale insects have been especially prevelant this year, with heavy infestations showing up on Maples, Dogwoods, Rhododendrons, Azaleas, Taxus (Yews), Cherries and Plums. 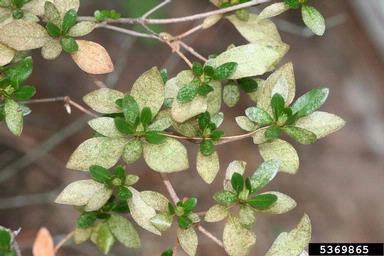 Another prevalent pest this year is the Lace Bug, which gnaws on the leaves of both Azaleas and Andromedas. 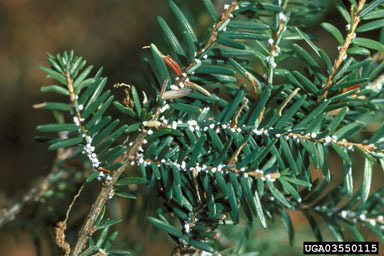 The Hemlock Wooly Adelgid has been especially active this year as well. Fortunately, while some are quite serious, all of the insect populations mentioned here can be managed with proper programs. However, it is definitely important to take action, and the sooner the problem is dealt with, the better. Why? The smaller the population, the easier the problem is to control. Plus, prolonged exposure to insect damage tends to negatively impact the strength of a plant in future growing seasons even if the problem has been corrected.